I feel like we've been waiting forever to find out what we're having. We've talked about various themes and decor ideas - I didn't think it would be so hard to pick! We've finally decided that we're going to try to do something a little "different" so we've decided to go with baby forest animals. Last week, when we couldn't tell anyone else but were excited about (finally) knowing that we're having a little boy, I started buying a few things for his nursery. I found this boutique through Kelly's Korner. She ordered something similar for her new little girl's nursery and I just loved it! We prayed for this baby for so long, I am so grateful for this miracle and that God is allowing us to experience this, and to be parents. I can't wait to meet my sweet boy! Aren't these adorable? I had her change them up a little and I did 0-3, 3-6, 6-9, 12, 18 and 24 months. 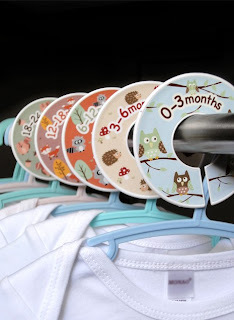 Mainly because I have already bought a couple of 24 month things and I wanted to make sure I could separate those out. I can't wait to start getting things in and (somewhat) start figuring things out and putting things up. Awwww! I love the frames and clothes sizers!! You are sooo going to have to send me the link to those!! I can't wait to see pictures of the nursery as you get it together!! THOSE ARE THE CUTEST DIVIDERS!